The term multiplane is from when real cameras were used to photograph animation. The technique I'm demonstrating here uses layer Z Depth-values to position the layers in space. Higher values goes into space, lower out. For the plates 0 puts them really close to the camera while 1 will put them away from the camera. Furthest limit is around 1.7 where the layers are too far away to move at all. The camera starts at 0 and goes into the scene, closer to the plates at positive values and away from the scene at negative values. 1 gets really close while -3 is far away from the plates. All circles are of the same size and all is centered in the canvas, not moving at all. The movement and depth is accomplished by moving the main or "camera" layer. First create a Circle Layer. Group this circle and name it "Content". You place all content of the plane in this group, this is what the circle represent. Group again the "Content" group and rename it to "Plane_01". This is the first glass plate. We will later duplicate and alter this to add more plates. Group the plate and rename it to "Main". This will be the simulated camera. Now, in the plate layer create three new layers, Blur Layer, Translate Layer and Scale Layer. First Export the "Z Depth" from Main. Name it Main_Z. Also export the "Origin" from Main as Main_Origin. Next we'll need an inverted version of this value to use in our calculations. For that create a temporary layer, say a circle, in any place of the layer stack. Choose a real value (for example the radius) and convert it to a Scale value. 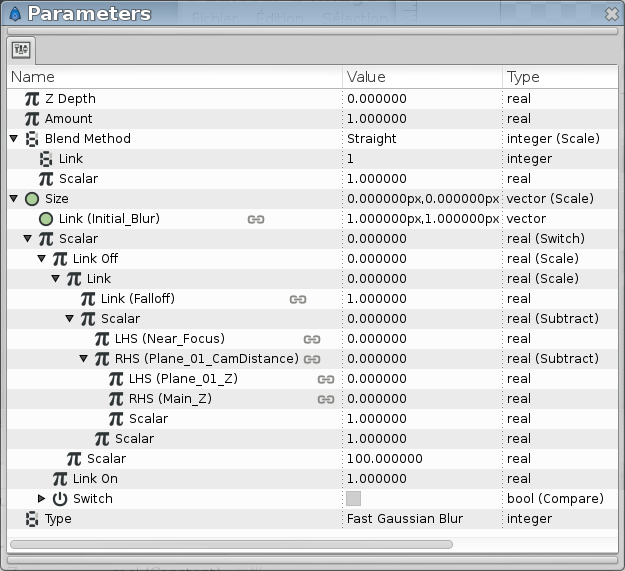 Connect the Main_Z value to "Link" from the scale converted and set "Scalar" subparameter to -1. Select the real value (i.e. the radius) and export as Main_Z_Inverted. Delete the temporary circle layer. We'll also want the Plane_01 "Z Depth" so export that as Plane_01_Z. Now we'll want the planes to scale based on it's distance from the camera. We'll use "Z Depth" to decide where the layer is in space. SCALE-LAYER Select the Scale layer of the plane. Now the plane will zoom based on it's distance from the camera which is decided by the sum of plane and camera "Z Depth" value. We reverse the number by scalar so it scales in the right direction. We use a separate Translate layer rather than the Plane "Origin" so that we can still move the plane undependable from the camera move. Connect "Link" to Main_Origin. This is what we'll base the movement of the planes on. Convert "Scalar" to "Range" and set "Min" to -1 to to avoid the layer to start moving the wrong direction when tracking out from the scene. Set "Max" to 999999 since we really don't need an upper limit. 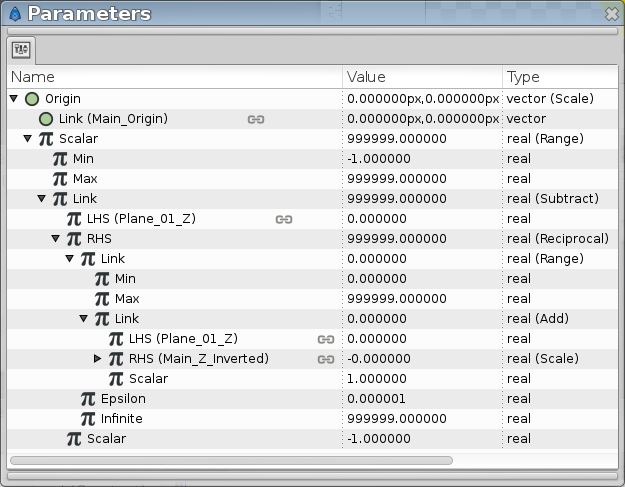 Convert "Link" to "Subtract" and set "Scalar" in this new calculation to -1. In "Link" connect "LHS" to Plane_01_Z and convert "RHS" to "Reciprocal". Next convert the "RHS" "Link" to "Range" and set "Min" to 0 and "Max" to 999999 to avoid some strange movement when layers move too far off the canvas. Convert the "Link" to "Add" and connect "LHS" to Plane_01_Z and "RHS" to Main_Z_Inverted. This whole calculation moves the layer more when it's closer to us and less when it's further away, thus creating illusion of depth. Create a temporary blur layer for exporting values. Convert a real value to subtract and set "LHS" to Plane_01_Z and "RHS" to Main_Z. Export this as Plane_01_CamDistance. 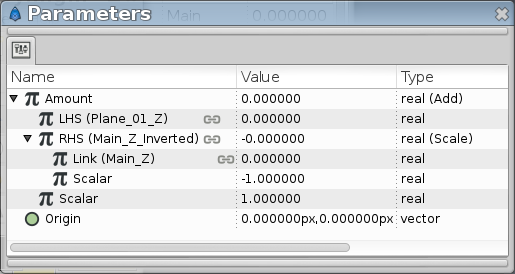 This calculation and export needs to be done separately for every new layer that is added. Delete the temporary blur layer. In the Blur Layer, Convert "Size" to "Scale". Connect "LHS" to Plane_01_CamDistance and "RHS" to Near_Focus, and check "Greater". Connect "LHS" to Plane_01_CamDistance and "RHS" to Far_Focus, check "Less"
Duplicate Plane_01 and rename it to Plane_02. 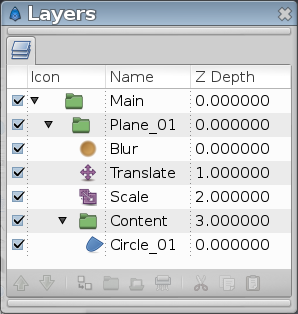 Select the layer "Z Depth" and Disconnect it. Then export it as Plane_02_Z. Open up the Scale layer "Amount" and connect "LHS" to Plane_02_Z. Create a temporary layer and convert real value to subtract. Connect "LHS" to Plane_02_Z and "RHS" to Main_Z. Export this as Plane_02_CamDistance. Delete temporary layer. Open Blur layer and change the 4 Plane_01_CamDistance references to Plane_02_CamDistance. Duplicate the plane as many times as you'd like and go through these steps again. Move to simulate camera movement. Use Z-depth to track in/out with camera. 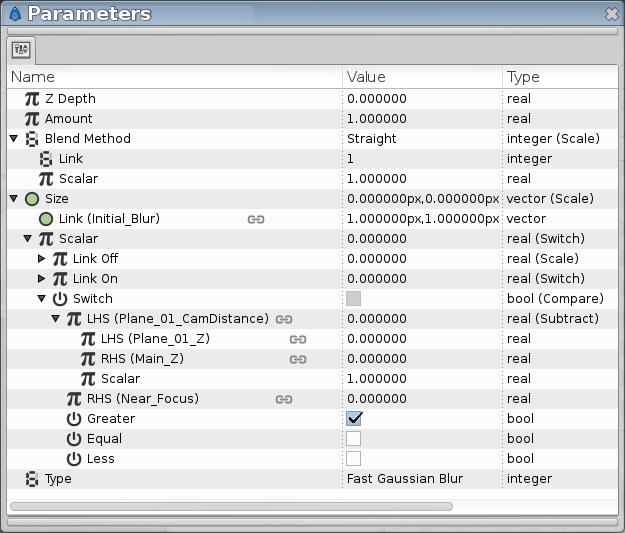 are moved, scaled and blurred in relation to the camera (MAIN layer) to simulate 3D plane space. • Translate layer - This is used to move the layers in relation to the camera layer. Once setup you should not manually change anything here. 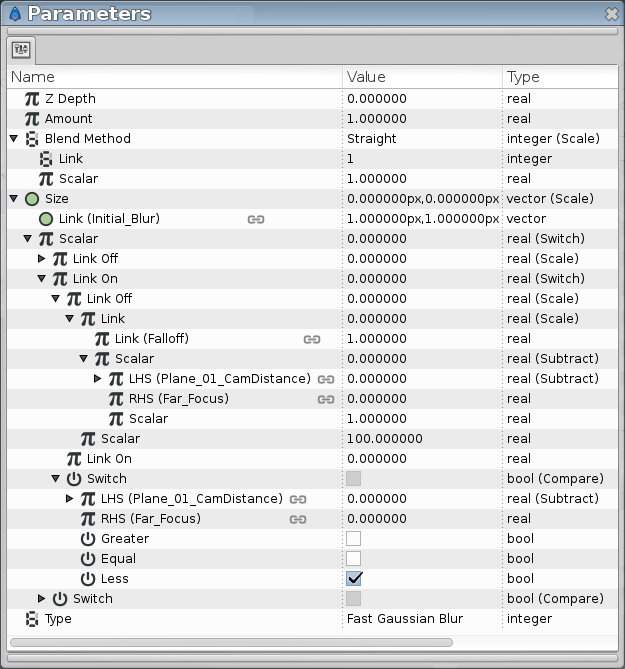 • Zoom layer - This is used to scale the layers to simulate distance from the camera. Should not be altered after setup. • Blur layer - This layer blurs the layers in relation to their distance from the camera. It simulates depth of field from different types of lenses. • Near-focus and Far-focus. Objects within this range from the camera (MAIN_Z - plane_Z) is in focus. • falloff - This value sets how fast objects gets blurry when outside the focus range. With a higher value the objects quickly gets blurry when leaving the range and with a lower objects needs to be far away from the range before getting blurry. This page was last modified on 13 September 2014, at 17:59.